Families in Portugal pay a lot in taxes, fees and charges having scored indeed so much that the country has achieved the second place in terms of who pays the highest fraction of taxes in their electricity bills, also coming up as the fourth country whose gas bill has a higher percentage of taxes reflected on its final costs. Eurostat released data this Tuesday that sheds light on these prices. “For the first time, Eurostat is publishing prices for electricity and natural gas that are fully comparable across countries” the European statistics office declared. They also showed that Eurostat is now “able to calculate the weighted average price reflecting the average price reflecting total household consumption” because of “the new data requested in Regulation (EU) 2016/1952”. “Prices can vary according to a range of supply and demand conditions, including geopolitical situation, the national energy mix, network costs and weather conditions” the report for the data release showed. Among the 24 Member States that provided data, varied between 10 cents (Bulgaria) and 28 cents (Belgium). 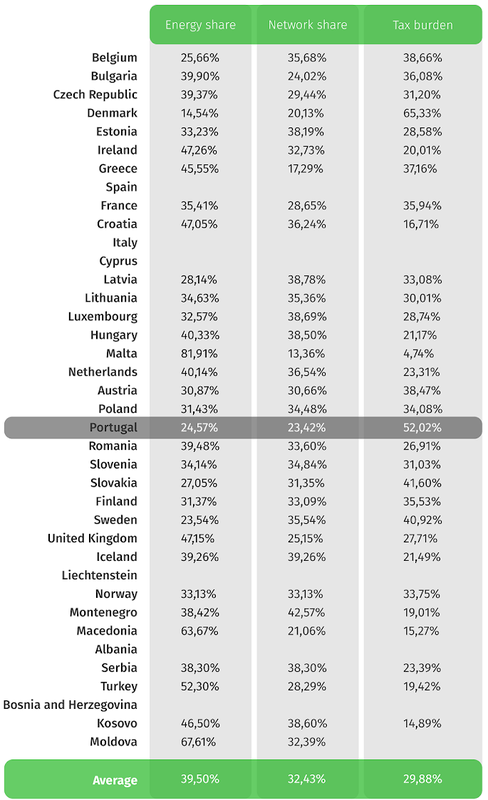 The new data is not complete because some countries have declared the information to be confidential (i.e., Greece didn’t release any data for their gas consumption) but Portugal shows in the top 3 of EU’s highest electricity and gas prices. In 2017 the only 2 countries that had a higher price than Portugal were Belgium (28 cents per kilowatt-hour) and Denmark (26 cents per kilowatt-hour). In Portugal, families pay 23 cents per kilowatt-hour, whilst the cheapest prices are found in Bulgaria, Lithuania, and Hungary (10 cents per kilowatt-hour). If we breakdown prices, we realize that families in Portugal have the second highest tax burden in Europe (12 cents per kilowatt-hour). This means that 52,02% of the price is tax-related. This value adds up to the debate regarding the reduction of the 23% tax on electricity, which has been on the table of discussions for the 2019 State Budget. 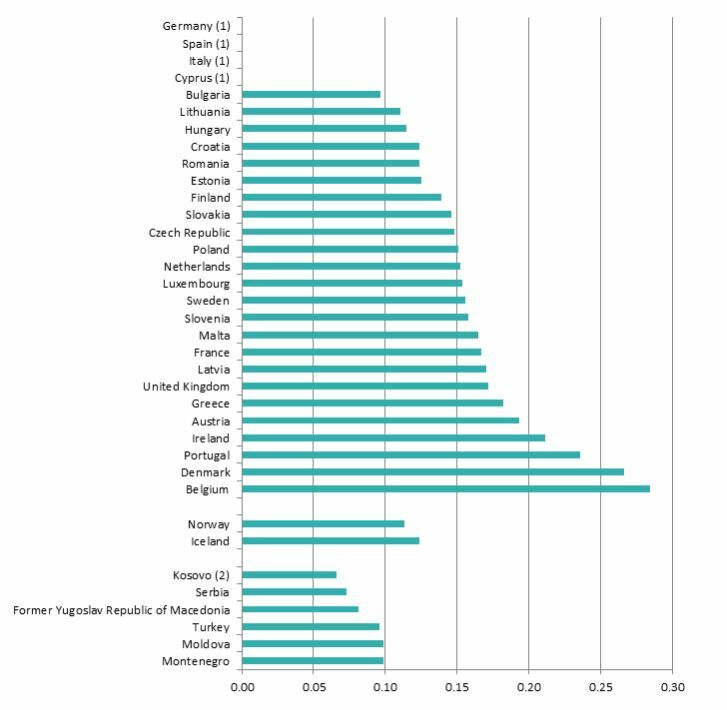 Only Denmark presented a higher rate of tax burden reflected in the electricity price (17 cents per kilowatt-hour, or 65,33%) than Portugal. The European average stands at 28,94%, with Eurostat taking note that the variations on EU energy prices are reflective of different geopolitical situations, national energy mixes, network costs and weather conditions. Importantly, Germany, Spain, Italy, and Cyprus did not present any data. Gas prices reflect the same issue for the Portuguese, as only Sweden (11 cents) and Ireland (0,096 cents) have registered a higher tax burden than Portugal (0,093 cents). In terms of natural gas prices indeed Sweden has a higher tax burden reflected in its price, but The Netherlands and Denmark also come before our country in terms of taxes weight alone. Regarding this indicator, the number of countries who haven’t released data is higher: Germany, Spain, Italy, Cyprus, Malta, Finland, and Greece did not disclose information about their natural gas consumption prices. Romania, Bulgaria, and Hungary presented the most competitive natural gas prices in the region.